Spray application of Tradical® Hemcrete® was specified for this 26 unit housing project with Orwell Housing Association. The Clayfield project is an exemplar for transferable ecological design in social housing, with extremely low embodied CO2 in construction and low energy requirements in use. As well as having green credentials, it is cost effective to build and contemporary in design. The award winning scheme offers affordable housing with a strong environmental emphasis. 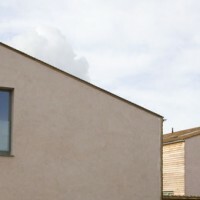 For the construction of Clay Field’s, 26 new affordable homes for Orwell Housing Association in Suffolk, architects Riches Hawley Mikhail Architects wanted to combine contemporary design, sustainable construction with low energy use and innovative local materials. To help achieve this, Riches Hawley Mikhail used Tradical® Hemcrete® from Lime Technology. A thermal hemp-lime walling solution that comprises a blend of hemp shiv and a lime based binder, it provides conventional looking wall construction whilst locking up CO2 by capturing carbon from the atmosphere. Hemp, in common with all similar plants, captures CO2 and releases oxygen during its rapid growth. The immediate and positive effect of this process is the sequestration of the principal greenhouse gas. Furthermore, this captured carbon is then locked into the fabric of constructed buildings. Finally, when the air-lime based binder sets, even more carbon dioxide absorption occurs. In effect, the material becomes better than carbon neutral. 1 cubic metre of Tradical® Hemcrete® wall can lock up 108kg of CO2. At Clay Field’s, it is anticipated the use of Tradical® Hemcrete® will enable the locking up of around 65 tonnes of carbon dioxide. For the latest information on projects like this, please contact us.